1. 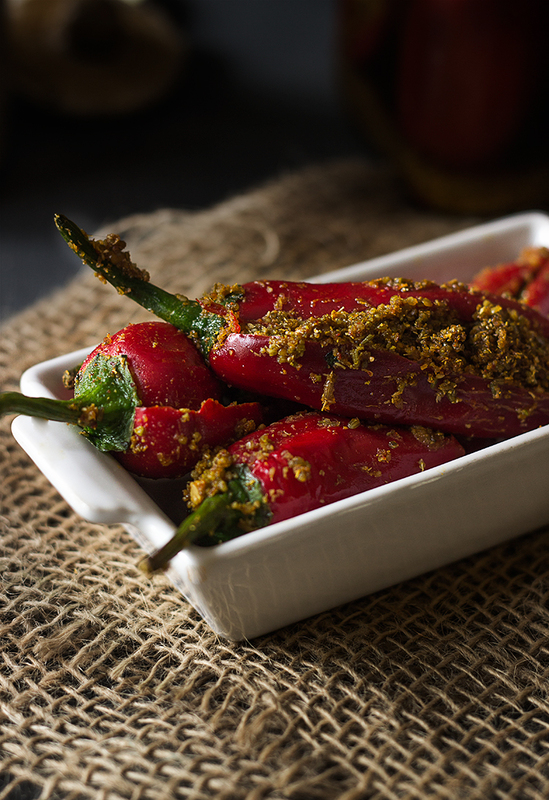 Wash and completely dry red chillies using a kitchen clot. Slit them lengthwise, so that we can stuff the spices inside, without cutting through. 2. Dry roast fenugreek seeds and allow to cool. Transfer to a spice jar of your grinder. Add coriander and fennel seeds. Grind them together into a fine powder. 3. Mix this ground powder along with all other spices and 2 tablespoons of mustard oil in a bowl. The stuffing is ready. Stuff generous amount of spice mixture in each slit chilli and set aside. 4. Once all chillies are stuffed, place them into a glass or ceramic jar. Add any remaining spice mixture. You can press them down also a little if you like. Pour mustard oil till about ¾ of the jar. Allow the pickle to ferment for 3-4 days. Enjoy when ready. Once the pickles softens, you may feel that oil is lesser and you can pour more oil. We prefer mustard oil but if you don’t then go ahead and use any oil of your choice.